Summary: In the Pictorial Guide Wainwright gave this fell the name Troutbeck Tongue with a subtitle of The Tongue, Troutbeck Park as that as how it was shown on the O.S maps at the time, only on the Bartholomew map was it given the name Troutbeck Tongue. Even today the name The Tongue is shown on the current O.S. maps. 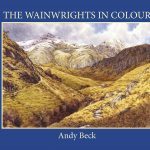 Wainwright considered this fell for inclusion on all of his lists and it has its own chapter in book two, The Far Eastern Fells. 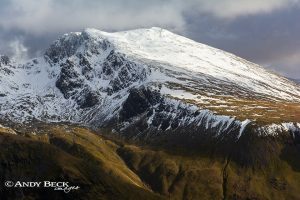 It is situated in the valley of Trout Beck to the west of the Ill Bell ridge and is surrounded by higher fells in all aspects except the south where Windermere is the focal point. There is no convenient point to ascend the fell from a nearby road, cars have to be parked either at Troutbeck village to the south or on the Kirkstone road where space is limited. 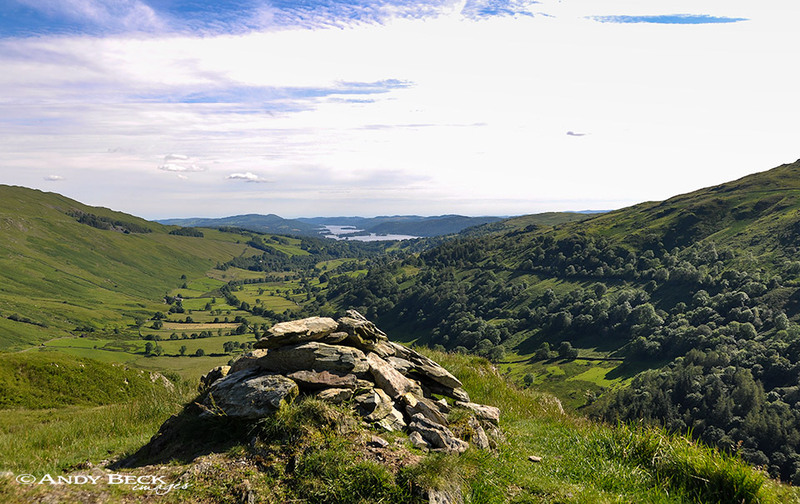 Apart from this slight disadvantage Troutbeck Toungue is ideal for a short walk or it can be combined on a route with other fells in the area. Topographical details: Wainwright’s summit is at the cairn at GR: NY42233 06386 and he took the height of 1191′ from the 1 inch maps. More recent surveying shows the actual height to be 1194′ 364m and this is at a point approximately 40m to the north of the cairn. Points of interest: Although it is nestled in between hills Troutbeck Tongue has a delightful grassy summit area with fine views of the pastures of the Trout Beck valley southwards towards Windermere. To the north along the summit ridge can still be found the old cairn as shown by AW. South-west of the summit is a small disused slate quarry. West of the ridge on the slopes of the fell is an old settlement but it is now very overgrown and difficult to identify but carry on down to the beck and you will find the old slate bridge, one of the finest examples in the district. It was severely damaged in the storms of 2009 but it has been restored to it’s former glory. 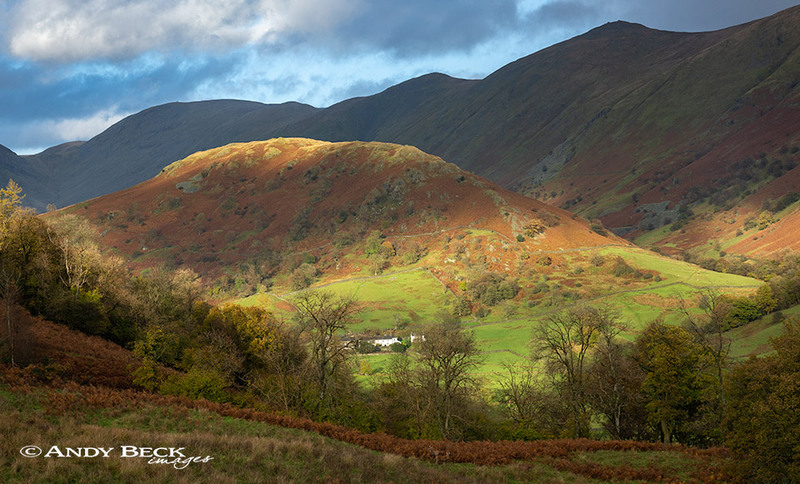 Tucked under the southern slopes of the fell is Troutbeck Park Farm, now a National Trust Property which was formerly bought by Beatrix Potter in 1923. The track that runs alongside the fell to the east and on up towards Thornthwaite Crag is part of the High Street Roman road. Waterfalls: Small falls below the slate bridge on Trout Beck. Nearest facilities: Car parking in Troutbeck village but space is limited. A small parking area can be found near Troutbeck church (free). Limited spaces in small laybys on the Kirkstone road but be considerate for other road users. Pubs at Troutbeck, The Mortal Man or at The Queens Head, both do food and accommodation. Star rating: (1.5 / 5) If this fell was nearer to a car park then it would be more popular than it is. Good views and points of interest.